At least 3 people on 3 separate occasions gave me the same advice this week. tell your pal you'd rather die alone than "walk the plank"! My ex-gf was furious when I suggested an OKCupid account. The problem is that if I do what interests me I won't find myself anywhere near single women. I chuckled at the discrepency. 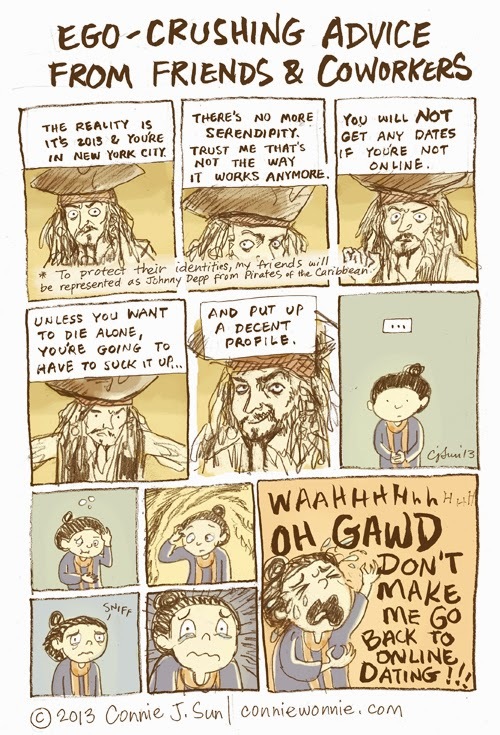 Captain Sparrow and dating advice: genius! By the way, there's a book called, "Dating makes you want to die". I recommend it for us folks who think this dating thing is cockle-spat. I could say that comfortably as a woman who found a wonderful 2 year relationship with her now-bf through craigslist.